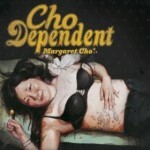 Miss Music Nerd’s Greatest Hits! I looked at your blog… but I don’t think I’ll add it to my reading list because I’m not that into music. But good luck to you in finding your readers! “Not that into music”? Say what?!? As you might expect, this is a phrase that really does not compute in my universe. I mean, just this afternoon, I was laying on my living room floor listening to the Adagietto from Mahler’s 5th Symphony, thinking that it doesn’t matter how many times I’ve heard it before — it always kicks me right in the solar plexus — in a good way, I mean! I could easily have shrugged off this comment (and I did, pretty much — the writer meant well, after all), but it got me thinking. It seems to me that for even the most ardent music lover, or the most dedicated professional musician, our relationship to music is not simple. Mostly, we do just really love it. But it does things to us that we can’t always control, and it requires things of us that are not always easy to give. McDoc and I are good examples of two different kinds of music lovers. Some people like to have music playing all the time — while they work or study, in the car, etc. — that’s McDoc. Other people find it difficult to do anything else while listening to music, because the music so captures their attention — that’s me. For the most part, if there’s music playing, it’s very hard for me to tune it out. I know that some people like to fall asleep to music, and this is something that’s very hard for me to understand, because if I have music playing I have no choice but to stay awake to listen to it! When McDoc and I return home after a concert, he often heads right for the stereo. Sometimes he’ll even want to listen to a recording of a piece we just heard on the concert! Even as I revel in my good fortune of having a spouse who so “gets it” when it comes to music, I often subject him to howls of protest when he does this. For me, it’s a matter of sensory overload — my sensitive little brain needs time to process what it’s heard before it can deal with more stimulation! For professional musicians, the relationship to music can be complicated by the fact that so often you have to study, listen to or perform music not of your own choosing. If you don’t like that music, it can be pretty painful! But again, music will do things to you. 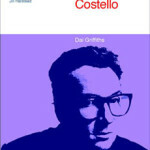 I once had a gig playing the piano for a production of a Broadway musical that I really did not care for going in (I won’t name it; I’ll just say that a certain French novelist is likely spinning in his grave at the thought that the musical, rather than the novel it was based on, dominates the search results when you google its title! 😉 ). But the odd thing about playing it night after night during the run is that I couldn’t continue disliking it — maybe I’m weak, or maybe I just knew that warming up to it was the only way to stay sane! It was more than that, though — the only thing that kept me from choking up along with everyone else during the big, tragic moments was the fact that my fingers were working so hard… and the knowledge that if I allowed my eyes to tear up, I wouldn’t be able to read my music! For a professional musician, I have a pretty pathetic little CD collection. 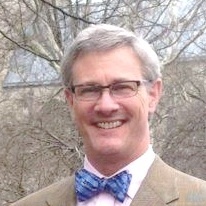 (You can help change that — see the upper right column of the blog! 😉 ) This is partly due to the fact that historically, I’m more apt to spend my disposable income on clothing than anything else (I’m a gal, after all! 😀 ), but it’s also because I have to meter my musical exposure to avoid getting overwhelmed! 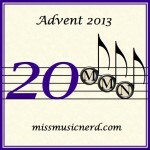 Miss Music Nerd’s Musical Advent Calendar, Day 20! 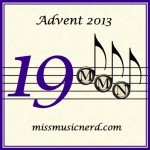 Miss Music Nerd’s Musical Advent Calendar, Day 19! Happy May Day and NaBloPoMo! Just finished a story for my Senior Writing Group which I call the Sound Track of My Life. Featured: my grandmother singing Welch folk songs to me, in Welch! (The earliest music I can recall). Then through the popular music phase of “Your Hit Parade” on the radio, the the choruses of college, Masses, Chorales, etc, and then, alas, motherhood. When I got back to music, I was no longer singing…but the final addition to my life’s iPod will be the Brahms’ Requiem. While I love Verdi, Mozart, and Bach, Brahms is the one that makes me cry even thinking about it. I understand what you mean about listening to music. I drift off to sleep with some silly (SouthPark) cartoon on the TV. But music, even at 3 a.m., and some really objectionable modern jazz on the bedside radio, compels me to listen. Back to a cosmetic ad on the TV to get to sleep again. Music MUST be listened to, and analyzed, and learned. And loved. Music is balm for my soul. I crave different sounds at different times in my life, but there must always be a score. “Not that into music”? What planet is she from? Maybe she likes movies more? I’ve always liked TV, movies, and music videos more than actual songs. ()% of people that say music is they life have never played a single instrument. 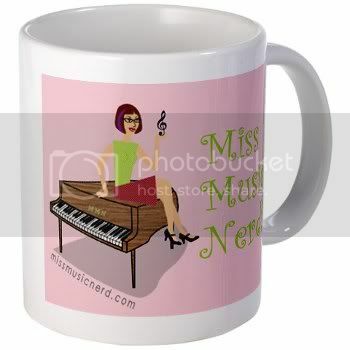 Click to visit Miss Music Nerd's Shopping Nerdvana!